We all meet in Atlanta where we will converge on our international hostess, my best friend, Sandy. It is a tight schedule of shopping, shopping....and more shopping. I absolutely cannot wait to go! I hope I also run into some of my U.S. quilting friends while I'm in Kentucky. The show is April 22-25. Sew...in the meantime...I've started my shopping list. I haven't sewn much in the last two days but here is where I ended up in my scrappy block project. I have kept working away on my evening project, the princess stocking. 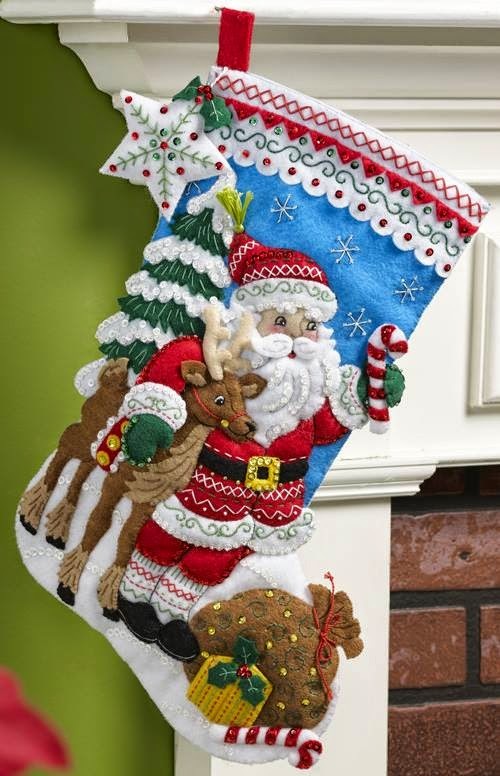 There are new stocking designs being released....this is why I never stop making these kits...sew adorable. I love the new line of Nordic designs...just look at this one!!! Back to "working" on my shopping list. Yesterday was spectacular. I couldn't cram enough into the day. There is something about brilliant sunlight that acts like an energy booster. I tried to spend as much of the day outside as possible. I was waiting for the traffic light to change on my morning fitness walk when it dawned on me how pretty my view was at that moment. This is one of four massive statue structures on the four corners of the Pont Alexandre III bridge which crosses the Seine. Construction of the bridge began in 1896 and ended in 1900. The bridge was constructed with the intent to strengthen France's ties with Russia which is why the French built a bridge in Paris honoring the Russian Tsar, Alexander the III. A great view of Musée d'Orsay. The structure started out as a train station. Then I had to wander to the Luxembourg Palace which always has beautiful flowers. These large flower beds flank the palace. The borders on the beds are the tiniest strips of boxwood shrubbery. I don't think I can replicate that in Alaska. I could smell the grape-like scent of the hyacinth bulbs...love the combination of the two purple tones. Beautiful entry doors to apartments. Since the weather forecast is so crummy for the rest of the week, I started a simple project I picked up in Atlanta. I bought a set of 48, 10-inch batik squares that were meant to be cut up for a stack-n-wackish look. I went with a very regimented two-inch strip cut as I went counter clock-wise around each block. Here are my first eight blocks. The pattern I bought calls for setting them on point alternated with a navy mottled batik. I might have something in my stash in Alaska but it gives me something to do without resorting to a UFO! It has been "inside" weather lately...chilly, cloudy and windy. I finished up a cross stitch ornament, " Von Klaus." He was the last one in this set of Antique Santas. The Princess stocking is getting to the fun part...her dress. I love her tiara. I had one of those pesky birthdays so treated myself to a little online quilt store shopping. I had it all sent to Alaska for my arrival in May. I'm getting anxious to get home. I found a cute dark pink batik with Eiffel towers...definitely got some of that! I've also been going through a quilt design workbook with EQ7. I'm learning some pretty nifty stuff. Yesterday I learned how to add appliqués to a quilt design. This could be a whole new avenue for me to travel...appliqué. Spring disappeared yesterday but I had already planned an outing to the medieval museum, Musée de Cluny. I'm glad I finally made it there. It was right in the Latin Quarter area of Paris but this big structure seems almost hidden away. Here is the very unassuming entrance. 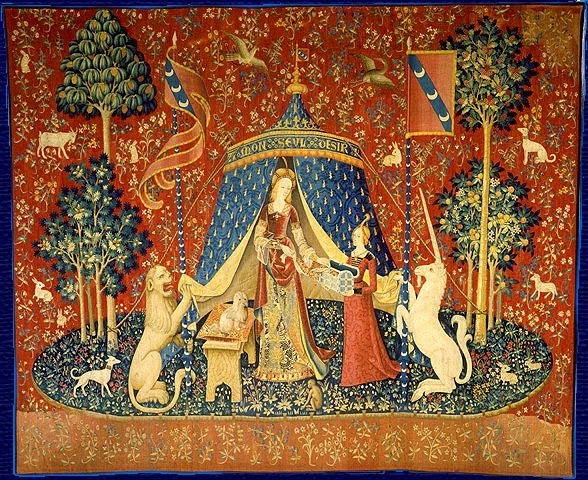 The museum is known best for its collection of tapestries, specifically a series of six that feature a lady with a unicorn. The tapestry photos are from Wikipedia. They are much better than my attempts to get a photo in these dimly lit rooms. There are five on one side of the room displaying five senses: taste, smell, sound, touch and site. The sixth one is a bit more obscure in its meaning but one popular thought is it represents the moral and spiritual heart. 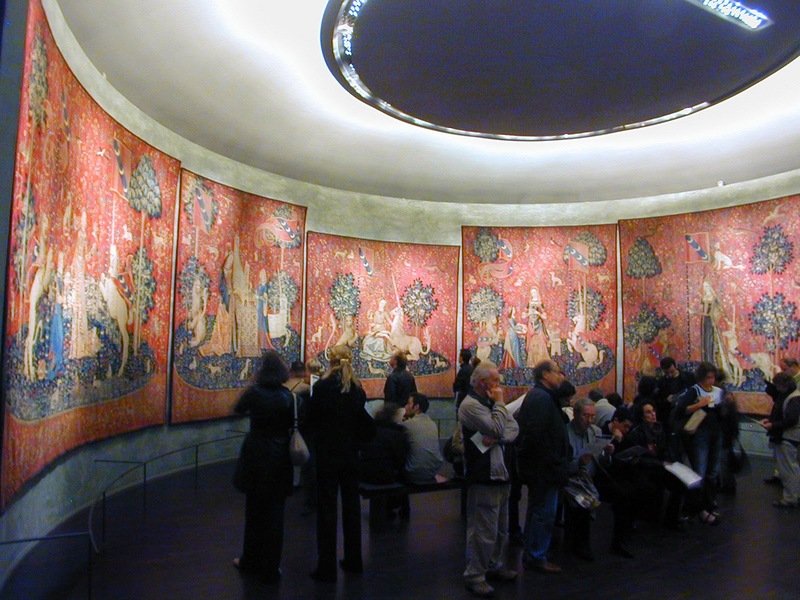 All the tapestries have been dated between 1480 and 1508. I thought they were all beautiful...the next best thing to having beautiful quilts to hang on your chateau walls. Many of the rooms throughout the museum were painted in this brick red color...an excellent choice for displaying other tapestries and medieval artifacts. The Cluny is a small, intimate museum that sometimes feels like you are walking through someone's home. I sometimes wondered if I was going the right way with a few little twisting hallways. There were two display areas with stained glass windows where they were at eye level and back lit so you could really see the details in the work. It was unique to see the windows at eye level instead of craning back your neck in a cathedral setting. I wanted to visit the cathedral Sainte Chapelle but the line to enter was long and my coat wasn't warm enough to wait so it will be an outing for another day. The stained glass windows are supposed to be stunning. Maybe I need to pick a sunny day for that visit? I am still in the tourist mode. The weather has been spectacular so I can't stay in my apartment all day. Here are a few random photos from my walks. Kind of a mini arc de triomphe commissioned by Napoleon to commemorate military victories. It sits between the pyramid entrance to the Louvre and the Tuileries Garden. This is a primary location for hawkers of bottled water, mini Eiffel Tower trinkets and clipboard carrying teenagers trying to swindle unsuspecting tourists. It is annoying to walk through this space with all that shady activity and other tourists but it was worth it on a pretty day. Here is Paris's city hall, Hotel de Ville. It is another huge, gorgeous old building. I have to smile...I'm getting used to these wonderful "old" structures. It is a little hard to see but there is a large black sign in the center with a message of solidarity regarding Charlie Hebdo. Two French police officers patrol the very front. The perimeter was heavily manned by police officers. Amazing sculptures all around the building!!! Construction was started in 1533 with this main portion completed in 1628. In 1835 two wings were added to house the growing city government. A fire gutted the structure in 1871 and reconstruction lasted from 1873 to 1892. And not far away is the George Pompidou Center, a modern art museum. I toured the exhibits two years ago but without an audio guide...modern art can be hard to appreciate without a little help! Walking in the sun is sew inspirational. I have several quilt design concepts in my head. I am hoping to remain diligent for a few hours a day to try and work on some of my concepts in EQ7. More walks will definitely be required. In the meantime...looks like the only projects I will work on right now are this new stocking, "Princess." And this cross stitch ornament. I have been catching up my blog reading too...I missed quite a bit last week. It is feast or famine for me when it comes to activities and visitors. I was so thrilled to have my sister-in-law and niece visiting with me last week. Here is a list of all the places we managed to visit. This is a great representation of what you can see during a week's visit to Paris. Please note it was the first week of March and not during the peak summer tourist months. More crowds would definitely add to the time needed for site seeing. Most American visitors arrive mid morning from the U.S. and are normally very tired because they flew all night and need to nap for two or three hours before hitting the sites. We try to get out the door by 4 p.m. for a little site seeing and keep our guests going until 10 or 11 p.m.
We then rode the metro to the Ecole Militaire area for dinner at La Varangue. After dinner it is a nice walk from the restaurant to the Champs du Mars for viewing the twinkling lights of the Eiffel Tower at the top of every hour...just for five minutes...then it goes back to the fully lit tower. 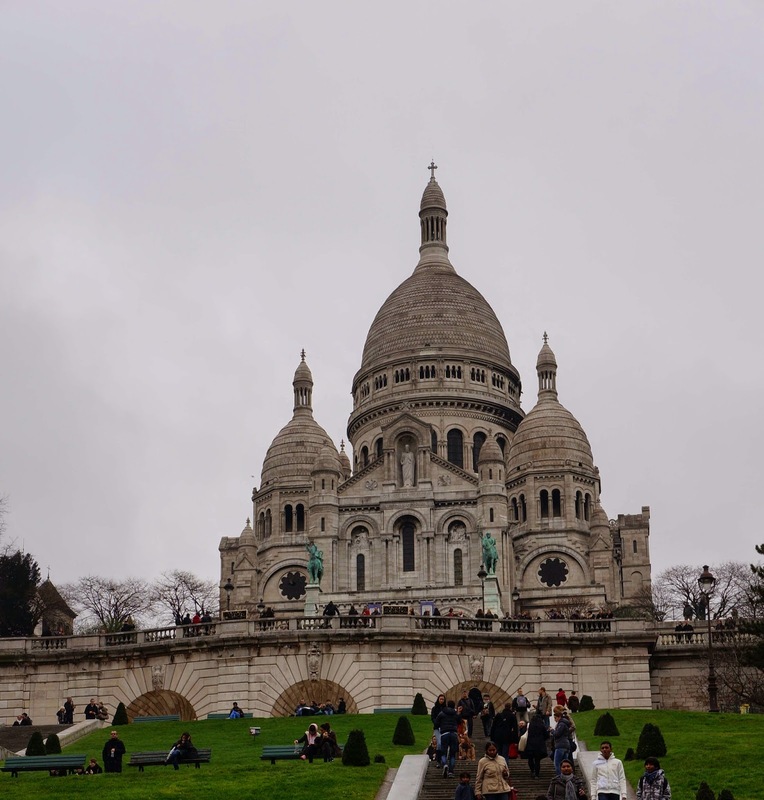 Visited Sacré-Coeur. Nuns were holding the mid-day Mass, using a harpsichord as their accompaniment. It was charming to hear the service. We then did some site seeing around Monmartre's main square, Place du Tertre. Lunch was at Chez Eugene's on the square. Great service, good food. We had quiche Lorraine with salad and French onion soup. 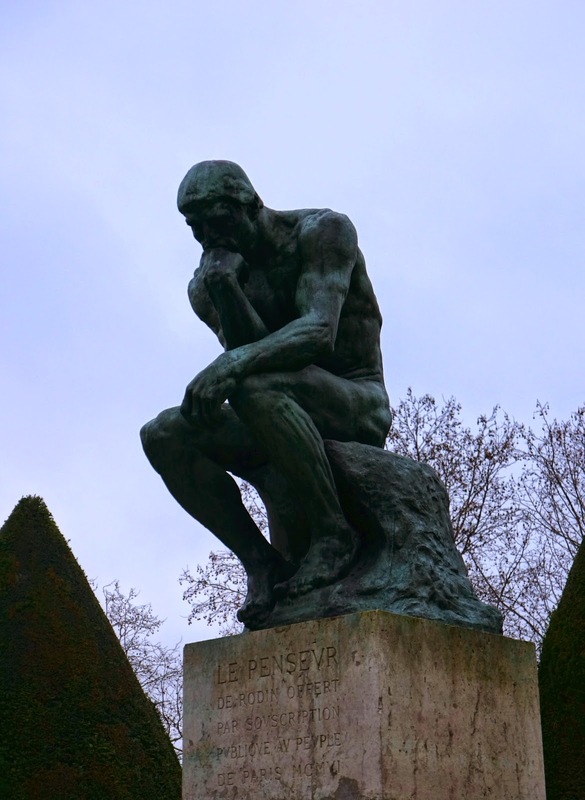 I avoid many museums on Tuesdays because the Louvre is closed, making other places more crowded but the small Musée Rodin is a nice one to fit in on a tight schedule. We had dinner near our apartment at Il Russo. Always excellent. Italian dishes. Small menu (usually just a selection of three pasta dishes). Generous portions. Family owned and operated. Very friendly place. One of our favorites. All Day at the Louvre. The museum was crowded. My strategy is to view the Mona Lisa first and then get away from that crowded space right away! The hall with the Italian paintings is usually the most crowded section of the entire museum. The Apollo Gallery was the model for the Hall of Mirrors at Versailles and is an excellent part of the museum to visit, especially if you don't have time for a visit to Versailles. My other favorite sections of the Louvre are Cour Marly and Cour Puget, two lovely enclosed courtyards with French sculptures from the 17th and 18th centuries. It is a bit off the mainstream tour at the Louvre so no crowds here! Here are my two big "insider" tricks when visiting the Louvre. Enter the museum from the Carrousel area (underground shopping center right off the metro stop for the museum). The crowds are larger entering from the famous glass pyramid on the street level. The line is really just to get through security. Rest breaks, shopping and lunch at the Carrousel du Louvre. We had a late lunch so dinner was a bottle of Chardonnay back at the apartment. All day at Chateau de Versailles. We left our apartment about 9:30 a.m. and made our way via the Metro to the RER C train. We caught the RER at the Champs du Mars location, a much nicer station/platform than my last trip via the St. Michel station. We bought our Versailles entrance tickets right next to the Pullman Hotel which is one of the last commercial buildings before hitting the entrance to the grounds of Versailles. We avoided the crowds which were buying tickets right across the street from the train station. Lunch at the restaurant, Angelina, inside the palace. This place is known for fabulous desserts. I can confirm it is justified! A pricey lunch but excellent food and a lovely quiet break from the crowds. We attended the noon Mass at Notre Dame. There was no music at this service. It lasted a little over 30 minutes. Then off to lunch on the adjacent I'Isle St. Louis. We wanted some savory crepes with cheese, veggies and ham. We were very pleased with our choice of the tiny restaurant, Le Sarrasin et le Froment Creperie. There was a second dining room off the main entrance so there was more room for diners than the tiny front of the restaurant. Very good food and service! The take-out window is popular with local students. After some souvenir shopping round the cathedral, we headed back to Notre Dame for the Veneration of the Crown of Thorns, a unique ceremony for Lent Fridays. The event started at 3 p.m. We went into the cathedral at 2:30 and were able to get excellent seats. (Look for the shorter entrance line for Mass participants next to the general visitor's entrance.) It took about 45 minutes for the service and viewing of the Crown of Thorns. There was a vocalist and the pipe organ was played. I highly recommend attendance of this event. I am not Catholic but my visitors are. We had just enough time to finish our day with a visit to Musée de l'Orangerie. We had dinner on rue Cler at Tribeca. One of my favorite go-to restaurants. Rue Cler is a street very friendly to American tourists with several restaurants that are not too pricey. Once upon a time, Julia Childs frequented a cheese shop on this street. Most of the day was spent at Musée d'Orsay. We started on the 5th floor where most of the well known French Impressionist works are displayed. We then headed to the second floor where you will find works by post impressionist artist, Vincent Van Gogh. If you still have the time and energy, there is plenty more art to view throughout the museum. There is an excellent restaurant on the 5th floor, Café Campana. Small menu. Fair prices for lunch. All week, we were on a little bit of a later schedule for all the sites which I think works well for avoiding the tour groups that show up when the doors open in the morning. Most museums open at 9:30. We would get to most places about 11 a.m. Since this was my guests' last day...we headed to the Lafayette Gallerie shopping area. It was horribly crowded on a Saturday afternoon! Hard Rock Cafe is nearby...just in case you have a teenage boy on your list of folks needing a Paris souvenir. After a trip back to the apartment to rest a little, do some preliminary packing and enjoy a glass of French wine...we went back to the Champs du Mars area for dinner at La Terrasse. It is another, American friendly restaurant with good food. Excellent atmosphere and it is a great people-watching location on a busy pedestrian corner. The seating is much more generous and comfortable than the typical French restaurant. 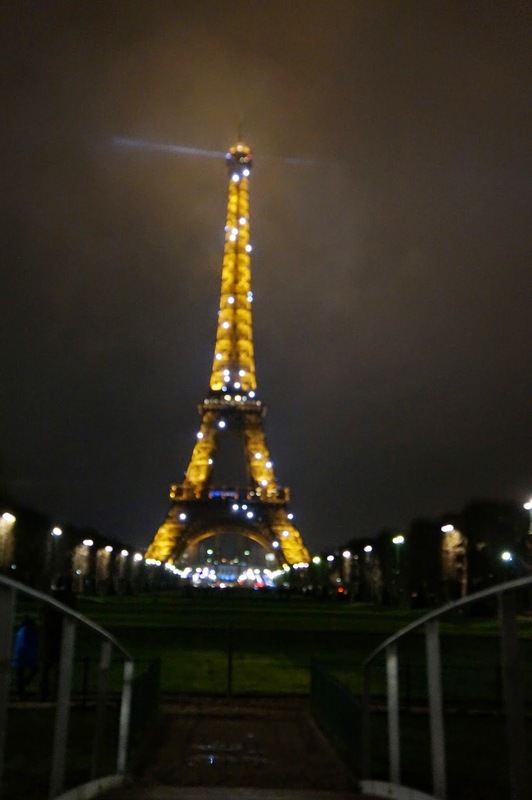 We finished our last night with another viewing of the Eiffel Tower lights twinkling at 9 p.m. Most flights back to the US leave in the morning so it needed to be an early night for us. It was an ambitious site-seeing schedule. I have never taken the time to go up the Eiffel Tower...I really don't like standing in lines! There wasn't a waiting line to go to the top of the Arc de Triomphe and it had a stunning view. Museum passes. The great advantage to the museum pass for Paris is the separate entrance at a few museums, like Orsay. Most of the time the big line for all museums is the security line that everyone has to go through. You need to visit at least two sites on the pass each day for the cost to be better than paying as you go. Also, once you activate the pass, it is only good for the number of consecutive days you purchased. We decided each night what we were doing the next day based on a number of factors like special events and the weather. The one time I purchased the museum pass a few years ago, I felt restricted by the schedule we had to follow. We did two museums a day, hitting ones that were open at night to fit it all in. A bit too much cramming I think for most people. You should have time to sit in a cafe and people-watch when you are in Paris. Don't spend all your time focused on the tourist sites!!! And another important tip. When eating in French restaurants, you need to ask for your check when you are ready to go. You will wait an eternity if you don't ask for your check. It is very nice not to feel rushed when dining in France. Slow down and enjoy. Now that I've got all this figured out...it must be time to move somewhere else...seems like that's how it always works. I'm working on a big post about our week of site seeing...mostly so I can remember it! My company is gone. My husband's trip got extended another week. It looks like I will get a little "crafting time." Yesterday I finished the final touches on two cross stitch Santa ornaments. The Santa with the bear is, "Kodiak Santa," and the one with the wolf is, "Aleutian Santa." I finally climbed all the stairs to the top of the Arc de Triomphe. Gorgeous views. Not too crowded. Just one of the six spokes that comes off the round about from the arc. This street leads to the business district, La Défense with its square La Grande Arche. When we walked down to the street level, we found ourselves in the middle of a small ceremony at the memorial flame for the World War I Tomb of the Unknown Soldier. Just one of several spectacular sculptures on the arc, La Résistance de 1814.
and then another finish in one day! Guess that means it is time to clean and prep for my visitors arriving on Monday morning. Rows pieced...so glad all the inner chain blocks are going the correct direction...I didn't double check that before I started writing this post. Two more borders to add. The blue will finish at an inch and the outer border will be five inches. I have felt like I was away at a quilt retreat this week. I got sew much accomplished.